Junior Accounts Officer and Junior Assistant jobs on regular basis. 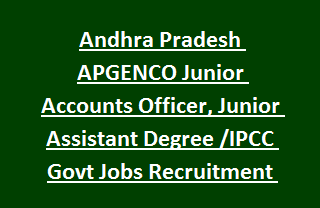 There are total 25 Trainee Jr Assistant and 26 Trainee Junior Accounts Officer jobs in this APGENCO Recruitment Notification. Candidates will be selected based on their marks/merit in written test for APGENCO Trainee Junior Accounts Officer and Junior Assistant Jobs. Written test will be conducted in Vijayawada on 30-12-2017. Candidates who meet the necessary qualifications they can apply online for this APGENCO Trainee jobs through official website of www.apgenco.cgg.gov.in from 13-11-2017 to 02-12-2017. Online applications are only accepted for this APGENCO Recruitment Exam Notification 2017. There are 51 vacancies in this latest recruitment of APGENCO Notification. As on 01-10-2017 upper age limit is 34 years for both the posts. For SC/ST/BC candidates upper age relaxation is 5 years and 10 years for PWD candidates. For Junior Accounts Officer Jobs-B.Com with first class or CA –Inter/IPCC or CMA Inter or M.Com qualification is required. For Junior Assistant jobs written test will be conducted. Minimum qualifying marks for this written test is 30%. Selection for this JAO jobs will be based on written test only. Candidates who are having the necessary application they can submit their application form online on before 02-12-2017 through APGENCO recruitment website of www.apgenco.cgg.gov.in.